Shannon Perry is a speaker/singer/writer whose new If The Shoe Fits women’s conferences combine her teaching prowess with her musical talent. Perry’s new music CD entitled The Real Thing (produced by LifeWay writer/producer Paul Marino) features songs specifically written to fit in with the theme of the conferences. She has had many disappointments in her life such as her childhood struggle with weight issues, living through broken relationships and finally finding a husband and then walking him through cancer. She found it difficult to write new songs for the album while sitting in a hospital room while your husband under goes cancer treatment. She has a beautiful voice and her songs are inspirational. My favorite song is "Bad Hair Day." We all have had one of those days at least once in our life and the music video above was great. I was able to relate to the songs and I have had to face some of the struggles that she faced. 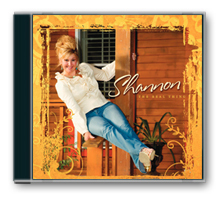 Shannon has a great sense of humor and wrote beautiful songs from the heart. I will recommend the album to my friends and family. Disclaimer: I received a free copy of the album from The Adams Group and I was not compensated for my review. Hi, I am a new follower from the Relax & Surf Sunday Hop. I hope you can stop by and take a look at my blog, I have a lot of great giveaways going on right now. I see you are a part of Cynthia's tour. I'm so excited I can't wait for it to start. I am your new follower. You can visit me at http://showmemama.blogspot.com. Leave me a comment, so I know you visited. Hello, I am a new follower from Relax & Surf Sunday. I look forward to reading new posts from you.